"He lived for a dream that wouldn't die." 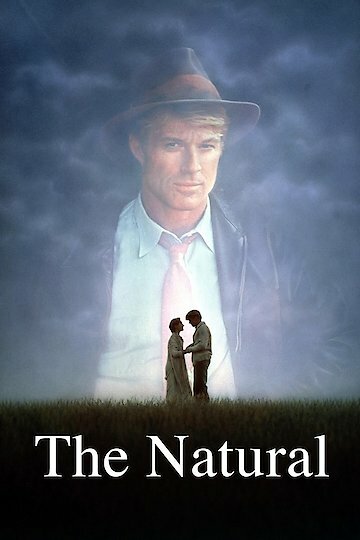 The Oscar nominated film The Natural stars Robert Redford, Kim Basinger, Glenn Close, Barbara Hershey and Robert Duvall. The film is beautifully shot by acclaimed cinematographer Caleb Deschanel and deftly directed by legendary director Barry Levinson. The movie is loosely based on Bernard Malamud's book of the same name. In post depression era 1930s, Redford plays Roy Hobbs, a middle aged man who shows up out of nowhere to join a losing baseball team. Hobbs turns out to be a brilliant hitter with a seemingly magical bat made from lightning hitting a tree. He takes the team from an all time low to an unprecedented winning streak. It turns out that Hobbs has a big secret from his past. As a young man, he was a exceptional pitcher who did not appreciate how gifted or lucky he was to be a part of the sport. One day, a strange woman on a train approached him to talk. The woman then stalked him and tried to kill him. It turns out that this woman was a serial killer who killed brilliant athletes who do not appreciate their own gifts. This senseless act of violence changed the course of Roy Hobb's life. The Natural is currently available to watch and stream, buy on demand at Amazon, Vudu, Google Play, FandangoNow, iTunes, YouTube VOD online.